ARLINGTON, VA; December 4, 2014 [Updated January 6, 2015] – On the heels of a record-breaking U.K. ratings bonanza — with its recent season finale reaching half of the country’s television viewership — THE GREAT BRITISH BAKING SHOW (called “The Great British Bake Off” in the U.K.) makes its U.S. premiere on Sundays from 8:00-9:00 p.m. ET, starting December 28, 2014, on PBS (check local listings). Renowned British bakers Mary Berry, the U.K.’s “doyenne of baking” and a leading cookbook writer, and Paul Hollywood, one of Britain’s top artisan bakers, serve as the series’ judges. Together with hosts and comic foils Sue Perkins and Mel Giedroyc, Berry and Hollywood search for the country’s best amateur bakers by testing their competitors’ skills on cakes, breads, pastries and desserts of all kinds, ultimately crowning a winner after 10 weeks of competition. The series is produced by Love Productions, a U.K. and U.S. based production company that has made several award-wining series in both the United Kingdom and the U.S. 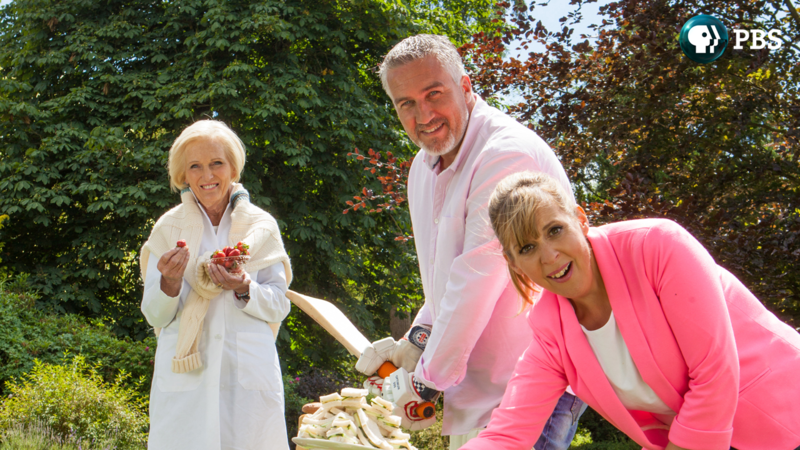 The U.K. version of “Bake Off” has become the highest-rated food show ever made in Britain. In each episode, the challenges come in three categories: the Signature Bake that tests the bakers’ personality, creative flair and baking ability; the Technical Bake, when bakers are given one basic recipe, with the same ingredients and instructions, but no other guidance; and the Showstopper Bake, in which the competitors showcase their depth of skill and talent. In this category, judges seek the most impressive and elaborate creations — which must taste first-class, too. “We are delighted that PBS has decided to broadcast THE GREAT BRITISH BAKING SHOW after its stellar success in the U.K., where it’s known as ‘The Great British Bake Off.’ We have watched the series grow into a great show full of surprising bits of cooking information that, once learned, are never forgotten. It also has an essential generosity and good-heartedness that makes it exceptional among competitive formats. You feel that everyone involved wants the best outcome; even though they know they have to be steely in their final judgements. We’re very pleased it is coming to America,” said Richard Mckerrow and Anna Beattie of Love Productions. National corporate funding is provided by Viking River Cruises. THE GREAT BRITISH BAKING SHOW will be available to stream through PBS stations’ video sites each morning after broadcast, including video.pbs.org, PBS station-branded digital platforms, such as ROKU, Apple TV and Xbox, and on PBS iPad and iPhone apps. Throughout the season, fans can visit PBS Food (pbs.org/food) to learn more about the contestants and get exclusive recipes, photos and video clips from the program. The program will also be available for digital download. With nearly 60 years of cooking experience, Mary Berry is truly Britain’s “doyenne of baking.” Having learned the art from her mother, the adult Berry quickly established herself as a leading food writer and broadcaster. Over the years, she has published 70 cookbooks that are enjoyed by millions around the world. In 2012, Berry’s contribution to the culinary arts was recognized by the queen — she was appointed Commander of the Order of the British Empire (CBE) in the 2012 Birthday Honors. Paul Hollywood is one of the U.K.’s leading artisan bakers. The son of a baker, Hollywood trained as a sculptor until his father persuaded him to change careers. By combining his artistic and culinary passions, Hollywood has established himself as an innovator. During his time as head baker, he worked in some of the world’s most exclusive hotels, including the Dorchester in London. He cemented his reputation as a leading authority by publishing the best-selling 100 Great Breads, which to date has been translated into seven languages. THE GREAT BRITISH BAKE OFF has won two BAFTA Awards in the five seasons that have transmitted in the U.K. In 2014, it moved from BBC Two to BBC One. The ratings have grown over five seasons, and most recently the finale beat the World Cup finale and was BBC One’s highest-rated show of the year with an almost 50 percent audience share. THE GREAT BRITISH BAKE OFF has spawned several spin offs: Celebrity Bake Off, Junior Bake Off, which just secured a BAFTA Award for children’s entertainment, and many Bake Off master classes. There is also The Great British Sewing Bee and Britain’s Best Potter. The Bake Off format has sold in over 15 territories and is one of the most successfully returning series in France and Scandinavia.